The living room is a room in your house which, contrary to its name, no one is allowed to live in unless its cleared through Mother. The only time that one may enter the living room is if one’s parents are welcoming special guests, like one's future in-laws, Father's boss or the local members of Hadassah. All other times, the living room is strictly off limits and certain death awaits anyone who dares to cross the line. 2 What does one find in the living room? 3 Why does the furniture look so much like its covered in plastic? 4 Is the candy in the covered dishes for real? 5 If one is not allowed to live the living room, is the name accurate? 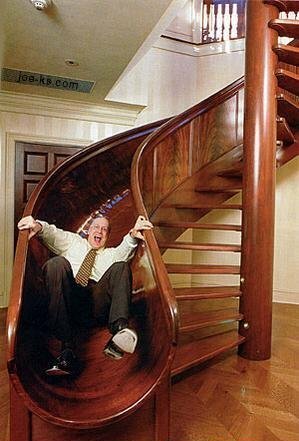 A crazy person's staircase. Crazy people have more fun! Depending on the type of house, a living room may either be in the front, near the front door, or in the rear, overlooking the fifteenth green which is visible through a picture window. One should also ask, is there wall-to-wall carpeting? If there is, pay special attention to the sweeper pattern in which the strands of wool have been brushed by the Dyson's beater bar. This pattern serves two purposes. First, it proves to Mother that the maid has vacuumed the carpet instead of eating up all of the food in the house and watching television all day. And it also proves to Mother that no one has broken the 11th Commandment, Thou Shalt Not Walk Upon the New Carpet. Technically, any room that contains living people is a "living room", but this usage has fallen out of favor, due to its extreme stupidity. Now, in order to be a living room, there can never be any live people in it. Ever. What does one find in the living room? If one is able to enter the living room (or if one must explore from the safety of the foyer) one will notice that the living room is populated with strangely shaped pieces of furniture and bric-a-brac. In the living room, one will find a sofa (Davenport™ or Chesterfield™), which is a long seating unit capable of holding three or more normally sized people, or one morbidly obese Auntie Hortence and her long suffering nephew. The "love seat" is not a seat, nor is it symbolic of love. It is instead a short sofa that accommodates two people. It is called a love seat because marketing research has shown that people are less likely to buy a “short sofa” than they are a “love seat”. One will also find one or more "occasion chairs". It is unknown what they are supposed to be during those occasions when they choose not to be chairs, but is known that they only do so every now and then. The "coffee table" is long, round or square table that usually is placed in front of the sofa, and is used for displaying books and nic-nacs but not really used for drinking coffee. A piano may also included in the room. No one has played it in years, and its dreadfully out of tune. Nevertheless, its there, just in case Niel Diamond's car breaks down and he rings the door bell hopping to use the phone and while he's waiting for the tow truck he happens to see the piano and decide to take it out for a tinkle or two. One may also find an enamel "ash tray" and a gold-plated Ronson™ lighter (which hasn't been filled with Ronsonol™ Patented Whale's Oil Aromatic Lighter Fluid in years) shaped like Aladdin's lamp. Why does the furniture look so much like its covered in plastic? Because, it is. The furniture is sealed in plastic slip covers, to be specific. It’s like embalming for furniture. The plastic slip covers are there to protect the upholstry on the furniture, because God forbid someone gets something on it and damage the delicate fabric. Mother (or Grandmother) has plastic seat covers because they think that people won’t notice that the furniture is sealed. They do this because, as proper hosts, they do not trust the guests to simply sit on the furniture; oh no, they are convinced that the guests intend to soil the upholstery. In rare circumstances, Mother (or Grandmother) will remove the plastic and actually allow people to actually sit on the delicate fabric, but that only happens when the Queen of England or Golda Mier is taking tea with the family. In extreme cases, Mother or Grandmother may use foam backed polyester throws to cover the plastic seat covers, because she doesn’t want people to damage the good plastic slip covers. If you encounter this, it’s a good indication that your host will also suspect you of stealing the good silver when her back is turned. Is the candy in the covered dishes for real? Yes, candy, usually Brach’s™ Sour Balls, or Jordan™ Almond’s, is often found in covered bowls in the living room. If there are Jordan Almonds, they will be color keyed to the decorating theme in the room. Because no one is ever allowed to use the living room, ever, no one knows how old the candy is; but when the question is raised, the candy magically becomes fresher than it really is. Whilst there may be candy, no one is ever allowed to eat it. Ever. Why? Well, according to Mother (or Grandmother) it is stored in bulk at the candy company "and the filthy rats crawl all over it." If this reasoning fails to resonate with small children, then one can expect to hear the story about the little boy who lives down the street who had a sour ball in his mouth and tripped while running home, chocking to death on the candy when it became lodged in his throat. This is, of course the same child who tripped while running down the street while carrying a scissors and was killed when he fell on them. No one knows the name of this child, or whether or not Mother (or Grandmother) will stand charges in the child's death for supplying the sour ball in the first place, but it isn’t any of anyone’s business anyway, no go out and play. If one is not allowed to live the living room, is the name accurate? Of course it is. Every home should have a nice place, just in case the President of the United States get a flat tire and needs to use the telephone to call Triple A. Of course, if the President had any manners, he would have called in advance so Mother would have had a chance to remove the plastic from the furniture.